The death of a matriarch brings forgotten secrets out into the open and causes a prolonged battle for the family inheritance. A political drama about a prime minister's rise to power, and how power changes a prime minister. A mobile task force is dispatched across Denmark to help local police solve tough cases. Dicte is a dedicated reporter and refuses to give up before she has her story. Her stubbornes gives her problems immediately with the policeman John Wagner, and they often get into clashes with each other. Police detective Sarah Lund investigates difficult cases with personal and political consequences. Investigator Jan and profiler Louise constantly move around in the thrilling periphery of a murderer's view as they link a series of killings. As more crimes and criminals cross borders, the Danish police creates an international criminal investigation team. The half Icelandic "Ørnen" leads the diverse team of 6. The latest technology (2004-6) is used. Politics, extremism and violence in Sweden. Copenhagen, 2017. 15 innocent people are held hostage underground in a subway train. A police inspector in the organised crime unit disappears after meeting with a mysterious informer. This is a ten episode edge-of-your-seat Danish thriller series. It was written by the same team who wrote BORGEN (2010, see my review), so it was bound to be good, and it is indeed spectacularly good. The complex and interweaving story lines centre upon massive corporate fraud in the wind energy industry. There certainly is a good deal of that, as I know from direct experience of it. 'Green' campaigners who push for wind energy often get secret financial commissions from the wind turbine companies for each turbine sold as a result of their 'idealistic' lobbying, so the environmental movement is seriously corrupt. I myself was asked to join in such schemes and was shocked at the huge sums being paid under the table to environmental activists posing as pure idealists. So I did not need any convincing that the central plot of this series was realistic. The energy company at the centre of the drama is called Energreen, and its CEO is an ambiguously charming figure played expertly by Nikolaj Lie Kaas, who also appeared as Mathias Borch in THE KILLING (2012, see my review). He is a mixture of idealistic fervour combined with psychotic ruthlessness. He doesn't hesitate for a moment to have someone who is getting in his way murdered. The basic corruption technique of Energreen is to set up shell companies in multiple offshore jurisdictions who successively buy wind farms from each other at higher and higher prices, thus pumping up the supposed values of the wind farms in preparation for a float of the main company at a vastly inflated value. But the shell companies are all secretly owned by Energreen, so Energreen is continually buying assets from itself with borrowed money and pumping up all the values to fantasy levels artificially, and then faking the prospectuses to investors by claiming that the artificial values are genuine. Side by side with this, Energreen also claims to be on the verge of perfecting a revolutionary technique to transmit power over large distances without loss by using superconductivity. I almost fell off my seat when someone in the series suddenly mentioned the Meissner Effect. With a shock I realized that the script writers must have consulted a scientist. Walther Meissner discovered the Effect named after him in 1933, but only experts have ever heard of it. It describes how a magnetic field is expelled from a charged current when it becomes superconducting. Kaas keeps telling investors and everyone in the company that his mysterious subsidiary in Poland, which operates in complete secrecy, is on the verge of perfecting superconducting power transmission (at ambient temperature, i.e. not requiring cooling to super-low temperatures.) This is all of course a fraud, and nothing of the kind is really happening, although Kaas is so deluded that he has convinced himself that maybe it will 'one day'. This is pretty sophisticated stuff for a TV series plot line. As it happens, in the real world, room temperature superconductivity has been demonstrated to exist and was first discovered in the 1970s. It happens inside our bodies, for instance, at the micro level. Freeman Cope published many technical papers about this before his mysterious early death. Information about this subject has largely been suppressed since the seventies by a combination of business, security, and military interests, using secrecy agreements and other methods. Consequently, only a tiny number of people are aware of this. There is no doubt that huge efforts are indeed being made to exploit room temperature superconductivity at the macro scale for industrial uses, such as the frictionless transmission of power over huge distances without loss passionately advocated by the fraudster Kaas. Indeed, the transmission of both positive and negative currents over astronomical distances takes place all the time in outer space by means of filamentary structures known as Birkeland Currents, named in honour of Kristian Birkeland, who first proposed them more than a century ago as the means of the Aurora Borealis being produced by currents from the Sun. I do not wish this review to turn into a physics lecture, but it is important to stress that this TV series has a serious grounding in advanced technological thinking, and has clearly had a scientific adviser of some kind, or at least has been based on some proper research by the script writers. The other main character in the series is the company lawyer named Claudia, played by Natalie Madueno. She manages to make the character fascinating, through her mixture of sensitivity and insensitivity, her apparent softness merely concealing a ruthlessness as great as that of her boss, Kaas. Both main characters are thus astonishingly successful studies of morally ambiguous people who have quietly gone over the edge into madness, and who are running a giant corporation. Well, nothing could be more realistic than that! Even the most remote backwoods person by now knows that most of the world's giant corporations are run by just such people. They are members of 'the international power elite' against which the world's population is now rebelling, an early sign of which was the election of Modi in India, and the latest example being the election of Trump in America. And we can be sure they they are just the beginning. This series therefore has a great deal to teach us, and is not merely entertainment. It also has a powerful sub-plot of two young yobs who are car thieves, and who become mixed up in an inextricable way with the corrupt dealings of the people they do not even know. 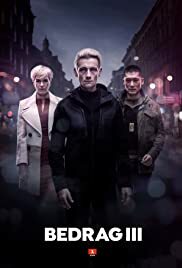 And the third main character is an admirable policeman who will not give up trying to expose the corruption, played by Thomas Bo Larsen with a quiet manner which is powerfully effective. There is also a sub-plot involving his irritating and faithless wife who has multiple sclerosis and is having an affair with her doctor. This is a fantastic series, which should definitely not be missed.